Simple styling and traditional design meet with this ladies' Pulsar stainless steel watch. Its textured silver dial and mix of silver baton hour markers and Roman numeral markers and silver hands adds graceful glamour to this timepiece. The soft grey leather strap gives this watch comfort and durability as well as timeless grandeur. This watch is also water resistance to 30 metres. 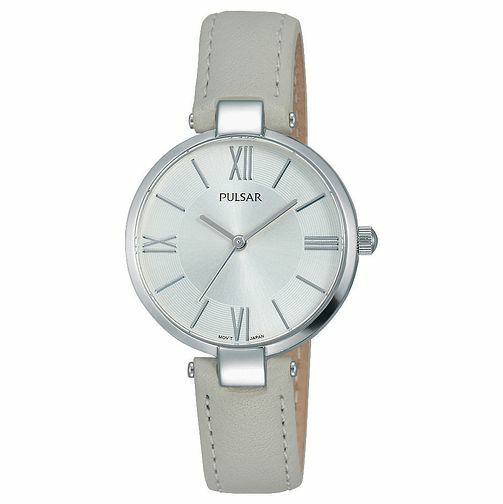 Pulsar Ladies' Stainless Steel Grey Leather Strap Watch is rated 5.0 out of 5 by 1.